Tim Stone is featured in Krista Tippett's book! Krista Tippett, NPR's On Being radio host, has a beautiful relationship with L'Arche. Through her interview with Jean Vanier years ago**, many people have come to know L'Arche. Since then, she has remained close to us and continued to share L'Arche with the world. In 2015, L'Arche celebrated its 50th Jubilee in Washington, DC. People from communities all over the US came together. 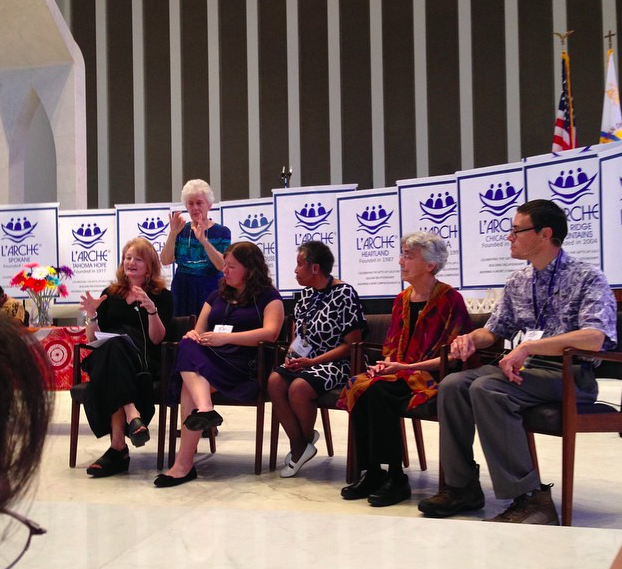 Krista attended the celebration and was a part of a panel, along with L'Arche Chicago's Sister Maria and Tim Stone. In April 2016, Krista published a book called "Becoming Wise: An Inquiry into the Mystery and Art of Living". In her book, Krista writes about meeting Tim, his "magnetic warmth", and his knowledge of the world. Her words are a beautiful testament to the striking nature of the life we seek to lead in L'Arche. We invite you to listen to the audio clip (below) of Krista reading the portion of her book where she is talking about L'Arche and about Tim. We know the truth that she speaks about Tim--how amazing that she has shared this with the world as well! Here is the page where Tim and L'Arche are featured! **The Wisdom of Tenderness the name of this On Being interview with Jean Vanier. It is beautiful and I highly recommend listening to it!